Flick through the press materials or browse the website of Mercedes’ latest lavish pick-up and it soon becomes apparent that there’s a distinct lack of building site on show. In fact, that classic image of workmen hauling gigantic pieces of plastic piping is nowhere to be seen and the sight of muddy boots, hard hats and high-viz jackets is committed to the cutting room floor. Instead, we have rubber-clad lads with surfboards tucked under toned arms, fellas unloading jet skis, expensive looking yachts, achingly handsome families on hiking trips and midnight blasts through the iridescent cityscape. If you look up the phrase “lifestyle vehicle” on Google, we wouldn’t be surprised if the search engine only returned an image of the X-Class. See, pick-up trucks are no longer the reserve of tradesfolk and Wickes catalogue subscribers, as favourable tax breaks have seen demand surge in the UK, with company car users cottoning on to the fact they could be blasting around in a pick-up for a fraction of the price of an Audi A6. Above all else, they are decidedly practical, impressively capable off-road and, above all else, cool. Not one to miss a trick, Mercedes-Benz has spotted the trend and committed to offering ‘the first true premium pick-up’ on the market, complete with stylish leather interior, myriad chrome exterior accents and all of the tech you’d expect in your exec whip. 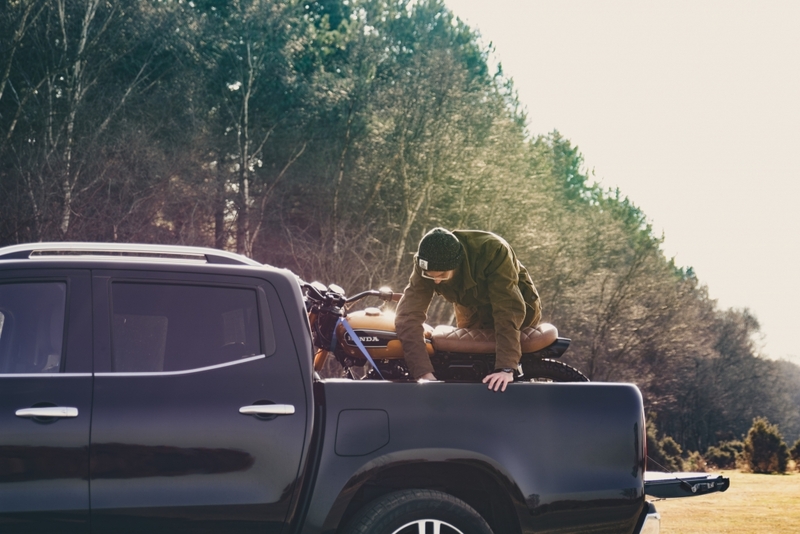 What better way to test the X-Class’s trend credentials than to strap a custom motorcycle to its bed and head off on a road trip to meet a bearded mechanic for a coffee? That’s exactly what we decided to do here and the first minor niggle surrounded the ride height (200mm ground clearance with option to increase to 220mm), which made loading a motorcycle with our flimsy scaffolding plank slightly tricky. 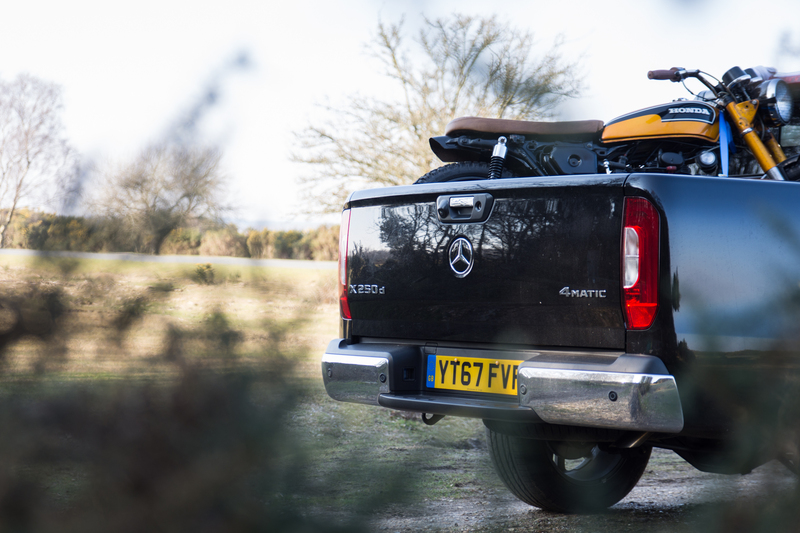 Secondly, the X-Class is only offered in a double-cab set-up, so there’s no option to squeeze a bit of extra bed length with single-cab variants, which does limit the length of load in the rear and meant we had to skew the tiny back at angle to ensure it fit with the rear hatch in place. 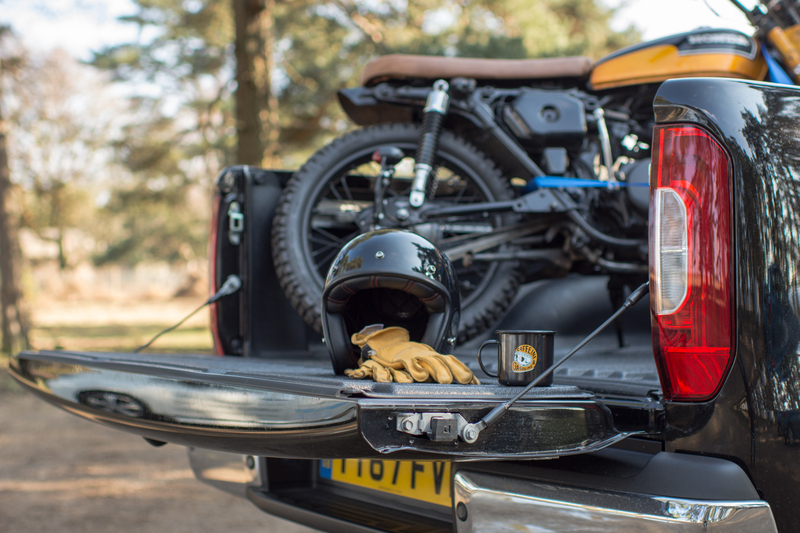 Finally, the lashing points on this particular top-spec X 250 d 4Matic Power model were situated on an adjustable rail mounted about midway up the bed walls, which made it difficult to tie down the bike in question. 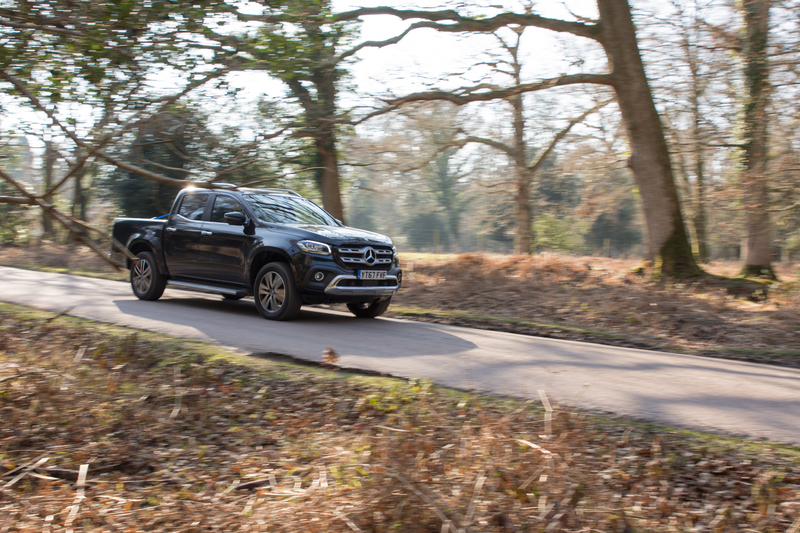 But with cargo finally secured, we hit the open road and headed for some of our favourite twists and turns to see if the X-Class could live up to its premium promise. 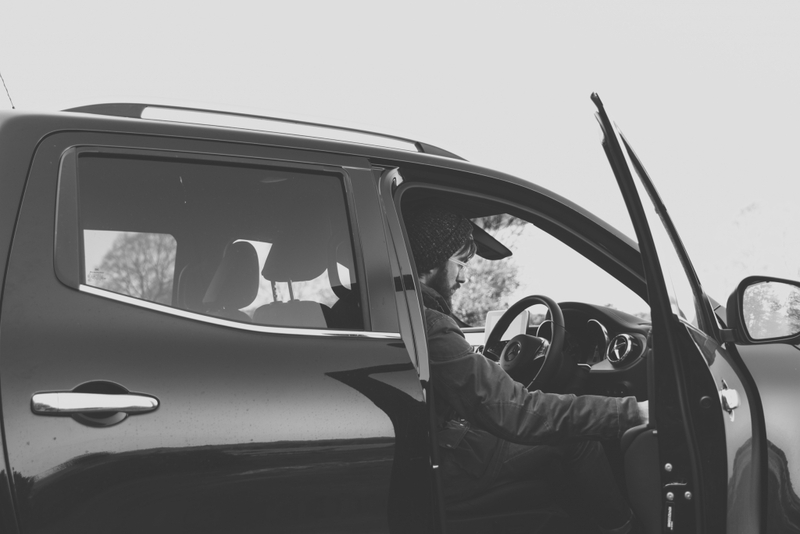 There’s no denying that the interior of the range topping X-Class is a cut above its rivals, boasting lashings of leather, chrome trim accents, illuminated mood lighting and Mercedes signature chrome surround air vents. It’s extremely well finished too, and it takes an extensive poke around the cabin to uncover some of the cheaper plastics that reside underneath the typically Germanic sheen. 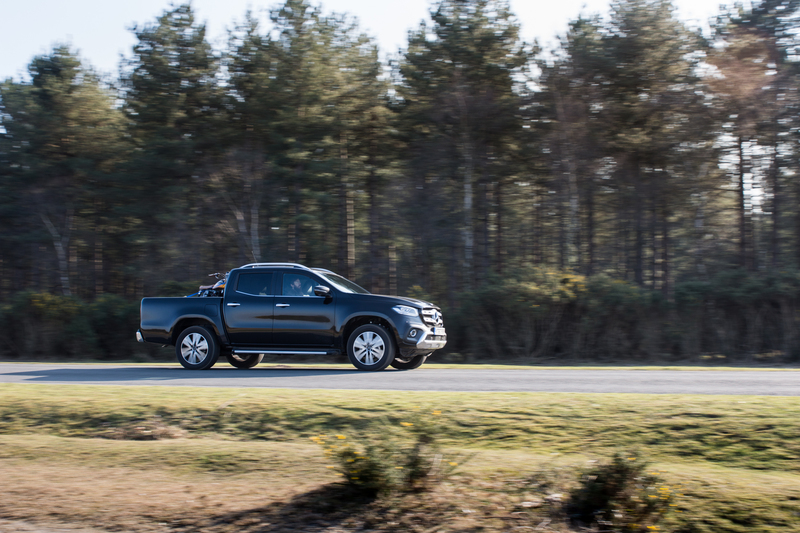 This is due to the fact that the X-Class has had plenty of help from the Renault-Nissan Alliance, which kindly offered the Nissan Navara as a donor vehicle upon which Mercedes could work its magic. In all honesty, the fact that the German marque didn’t create something from scratch is a tad disappointing, as so much of the Navara is visible if you know what you are looking for. The key fob is an immediate giveaway, but some of the interior switch gear and exterior body panels have been pinched wholesale, despite Mercedes’ best efforts to avert gazes with an enormous and aggressive signature front grille. Regardless, the XL alloy wheels, the flashes of chrome, the dazzling front and rear LED lamps and the “in-yer-face” badging ensure it draws admiring glances from passers-by in whichever town it rumbles through. One of the biggest gripes when using a pick-up truck as a daily driver surrounds the ride, which tends to be jittery at best, and downright abysmal at worst. 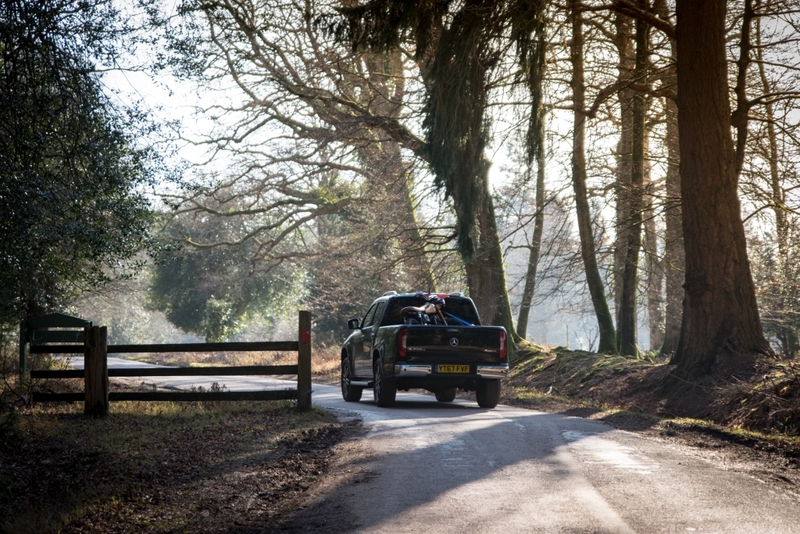 Mercedes engineers have worked tirelessly to improved upon the already excellent Navara multi-link suspension system, which not only provides a smoother ride, but sees it also handle a one-tonne payload in the rear bed. Driving the X-Class will still feel a bit unwieldy and awkward for those used to smaller, more traditional everyday offerings, but the steering is light without any awkward vagueness, the ride is impressively accomplished over most surfaces and the 2298cc turbocharged four-cylinder residing underneath the lengthy bonnet is powerful to cruise the motorways with little complaint. To keep up with rivals over at VW (we’re looking at you Mr Amarok), Mercedes says that a more powerful V6 diesel engine is on its way, which will likely offer the sort of grunt that premium pick-up customers are looking for, but the current crop is perfectly capable. 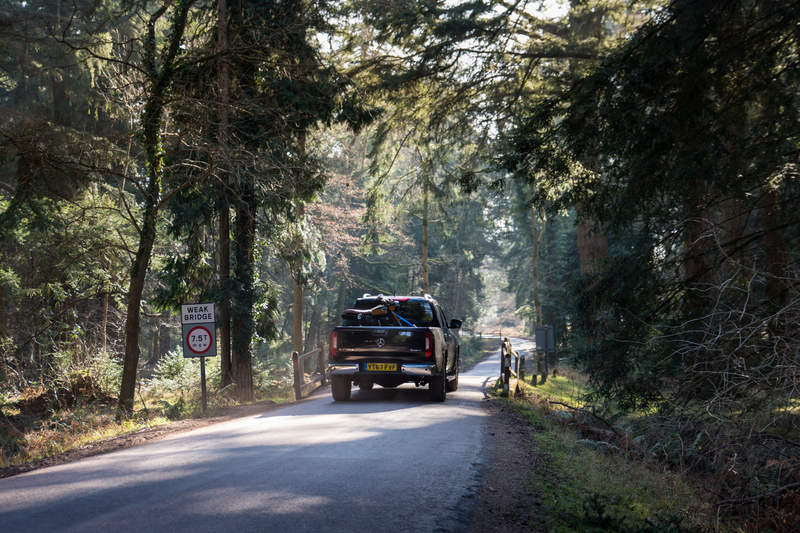 Even with a motorcycle in the rear, the X-Class was a breeze to thread through the narrow streets and twisting turns of our New Forest route, while a plethora of on-board sensors, a 360-degree camera and audible alerts ensured parking was just as much of a doddle. 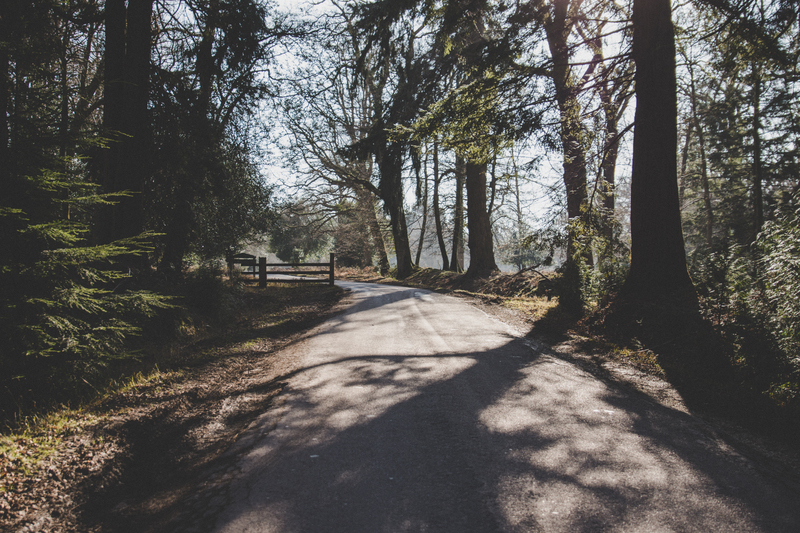 We racked up hundred of miles in the X-Class during our brief stint but it never felt uncomfortable, slow or awkward to live with, even during a weekend visit to the madness of London. Yes, it’s a bit disappointing that Mercedes didn’t unleash something truly unique into the segment but it has nailed the brief of creating the first ‘truly premium’ pick-up. The X-Class’s interior is super stylish, modern and packed with all of the gizmos a luxury brand convert expects, yet the tricked-out goliath still offers superb off-road performance, thanks to a low-range gear box and hill descent modes. It’s pretty decent on-road too, with only the Volkswagen Amarok coming close in terms of comfort and refinement. 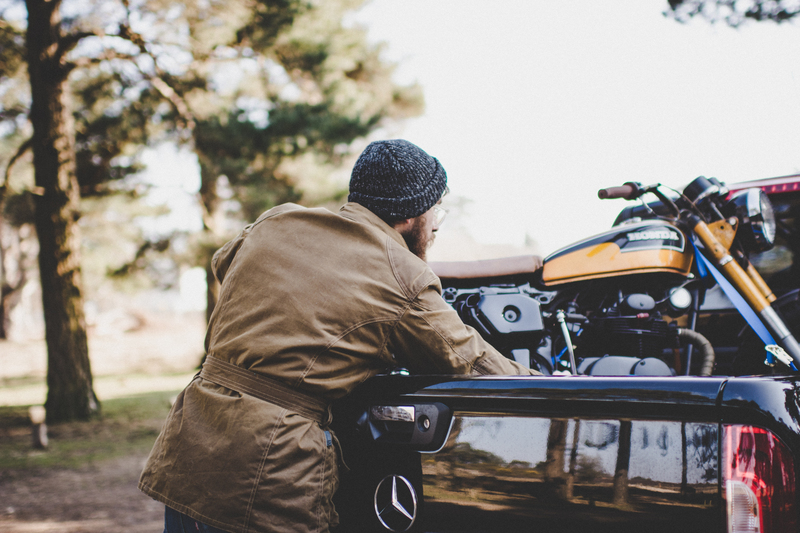 If you’re looking for a workhorse to carry massive plastic pipes to the next job, there are cheaper, hardier and more capable pick-up trucks out there, but none look quite as cool with a custom motorcycle in the back.